Operating Monday – Friday 7:00 am – 7:00 pm Brown offers two shuttle routes servicing College Hill, the Jewelry District, and the hospitals. The service is available to all Brown students, faculty, staff and hospital affiliates with a Brown University ID. In addition, Rhode Island School of Design (RISD) students may ride using their RISD ID. Passengers must show appropriate identification before boarding the shuttle. 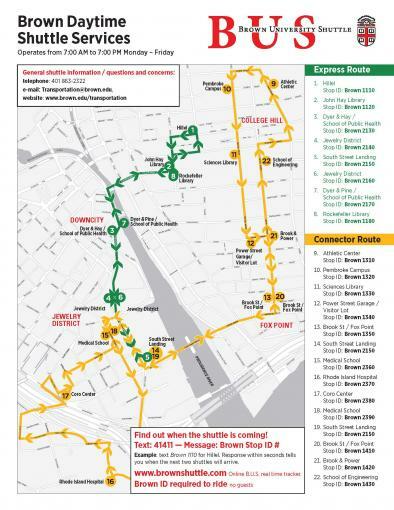 Express Route - Providing expedited service between College Hill and the Jewelry District, the route has a total of 8 stops starting at Hillel (corner of Brown and Angell Streets) and runs along Eddy/Dyer Streets and terminates at South Street Landing before returning to College Hill. The route runs on approximately 10-minute intervals and is serviced by two 20 passenger shuttles equipped with front mounted bicycle racks, vehicle graphics, and front designation signs. Connector Route - Connecting College Hill, the Jewelry District, and the hospitals, the route has a total of 22 stops running in both directions between Power/Brook Streets along Brook St (Fox Point neighborhood), South Street Landing and the Alpert Medical School with a loop on one end servicing the hospital and Coro Building and on the other end servicing multiple locations on College Hill including the Athletic Center and Pembroke Campus. The route runs on approximately 20-minute intervals and is serviced by two 13 passenger shuttles equipped with front mounted bicycle racks, vehicle graphics, and front designation signs. Track the current location of the shuttle using http://brownshuttle.com or use the TransLoc Rider iPhone/Android app. In addition, you can find out when the next shuttle will arrive by texting the stop ID. Text 41411 and text Brown space Stop ID (see sign or map) and the arrival time of the next two shuttles will be provided.